Radiolucent with no significant X-Ray, CT, or MRI artifact. Computer Numerical Control technology to precision mills the implant, using tolerances that are less than the thickness of a business card. The result is an exact replication of the patient’s missing bone flap! Our plans provide surgeons with additional treatment options and 24 hour turnarounds in emergency situations. With Kelyniam’s technology, cases no longer need to be scheduled weeks or months in advance – further reducing scar tissue and bone remodeling. 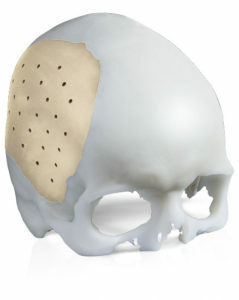 Full or partial skull models are available upon request when ordering.